THE HAGUE - Minister of Foreign Affairs Stef Blok was even deeper this weekend because of the dust he created with his statements about multiculturalism. The Minister of Foreign Affairs named Suriname a 'failed state' last week and attributed this, among other things, to the ethnic division of the country. The qualification 'failed state' in diplomatic traffic between governments represents those countries where the rule of law and democracy are completely lacking, such as Somalia. The remark caused a great anger in Suriname, where the government saw in the 'denigrating and destabilizing' remarks an 'agenda of re-colonization'. In a letter to his Surinamese colleague Yldiz Pollack-Beighle, Blok writes that he should 'have not made the statements' and that sincere apologies should be in place, 'partly in view of the great importance I attach to the relationship with your country'. That relationship has not been too well, especially since Desi Bouterse was elected head of state in 2010. In the Netherlands he was sentenced in absentia to eleven years for his involvement in drug trafficking. Bouterse is also the main suspect in the trial of the so-called December murders in 1982, when Suriname knew a military regime under his leadership. Since 2010 Suriname has no longer been an ambassador in the Netherlands. The country is represented here by a chargé d'affair. The minister made the criticized statements during 'return days' for senior international officials, at a meeting held at the Binnenhof. His officials had a speech ready for him, but Blok started a sort of discussion with the audience instead. Shocked attendees send recordings of the meeting to the TV show Zembla. 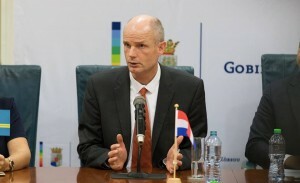 Blok also expressed regret to Aruba, Curaçao and Sint Maarten. These countries are part of the Kingdom of the Netherlands and are therefore also represented by the Dutch foreign minister. They had been particularly disturbed by Block's remark that he does not know any successful multicultural society. The Australian aborigines also joined the heavily insulted parties this weekend. They called the quote that eradicated the original population in the US and Australia "completely unacceptable". The ministry reports that in the meantime all countries that need it have received apologies and/or explanations. Officials from Blok's own ministry want him to commit to more diversity. A call to this was signed by dozens of employees on Friday. "Diplomacy, our profession, is based on the fact that different nations and cultures can cooperate peacefully," they wrote. "We want our ministry to reflect that thought." Blok has promised to discuss this with them. That happens after the summer. And then Blok also awaits a serious debate in the House of Representatives.